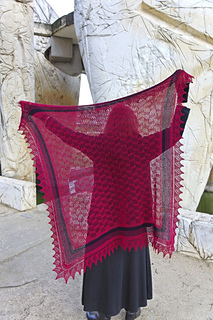 This pattern is available from renaissancedyeing.com for €55.00. 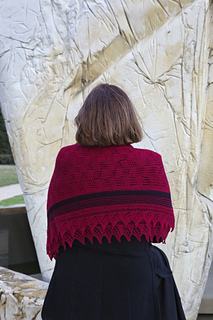 Inspired by ancient Shetland shawls, with a central square framed by two borders. A modern knitting method allows it to be knitted in a single piece, without seams, on a long circular needle. This is a project for patient, experienced knitters, the result is really worth your time. 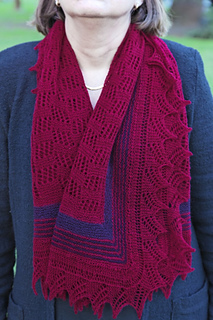 You can wear it in multiple ways, folded in a triangle, as a scarf or stole. 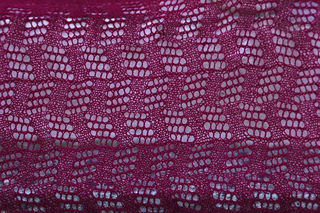 Kits (wool + pattern in English with written explanations plus charts for the lace pattern and border.) are available in the Renaissance Dyeing online shop. Mon premier châle carré, inspiré par les anciens carrés Shetland, magnifié par les belles couleurs végétales de Renaissance Dyeing. Les kits (laine + fiche modèle en français, avec explications écrites et grilles pour les points dentelle) sont disponibles dans la boutique en ligne de Renaissance Dyeing.